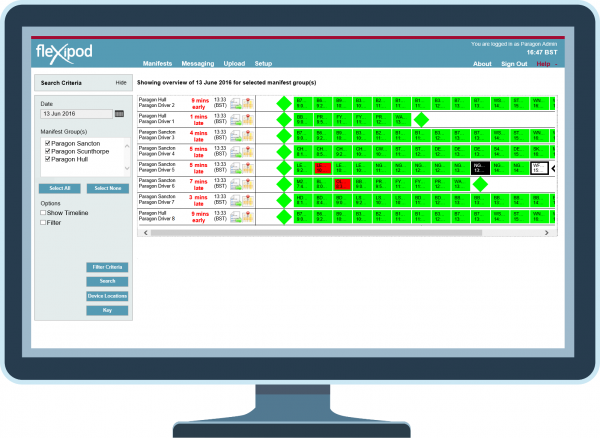 Our fleXipod central management console puts your operational management teams in control of mobile processes ensuring you can provide a consistent customer service and capture accurate regulatory or operational data. The ability to configure automated customer notifications further enhances the customer experience and improves operational efficiency within your busy office-based teams. Real-time data from the field enables your office-based teams to proactively manage customer service queries, mobile teams and delivery issues. With data available for reporting analysis and the ability to change mobile processes as necessary without costly software changes fleXipod can support the continuous improvement of your operational processes. Configure workflows and forms – Create specific workflows for your drivers to follow variable by different products, services, customer contracts and delivery scenarios such as ‘customer not present’. 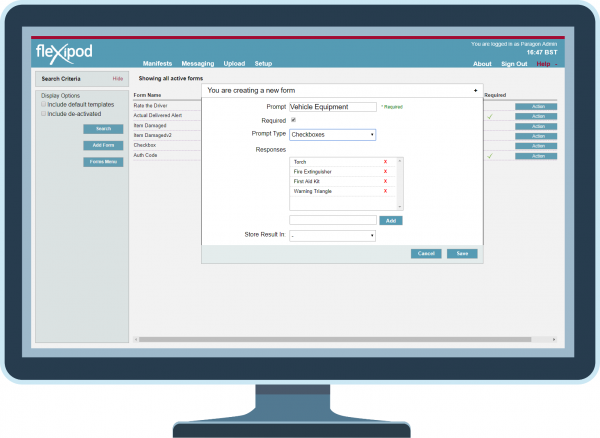 Use fleXipod forms to assign data capture requirements to each workflow including signature, photo and checkbox questions. Set up customer communications – Keep customers up to date and reduce inbound enquiries by automating pre-delivery reminder notifications, day of delivery ETA updates and post-delivery report emails as well as providing a real-time delivery tracking portal. Create exception alerts – Alert central staff when a mobile workers inputs data that meets your pre-defined criteria to flag exceptions that need immediate attention such as faults on vehicle checklists. These alerts are centrally configured so your staff only need to be notified of issues that are critical for your operation. Review real-time data – Stay on top of progress throughout the day with ‘at a glance’ overview and dashboard screens, advanced search and filter options. Completed POD data is also relayed from the field in real-time including time of completion, signature, photos and any forms associated with the job. Send messages to drivers – Send messages to all users, groups, individuals or in relation to a specific job with no additional SMS costs. Message notifications are visible at any point in the application with confirmation transmitted to the console when the driver has opened the message. Monitor device and user data – View a variety of device statistics such as signal, battery status and location, including a map view of progress against your expected plan. For operations receiving ad hoc jobs throughout the day, this enables the allocation of jobs to the most appropriate driver. Analyse reporting data – View key reports at a glance with the fleXipod reporting dashboard making trend analysis, depot or team comparison and daily KPI reporting simple. Each user can configure the dashboard to ensure only the reports that they need display each time they login. 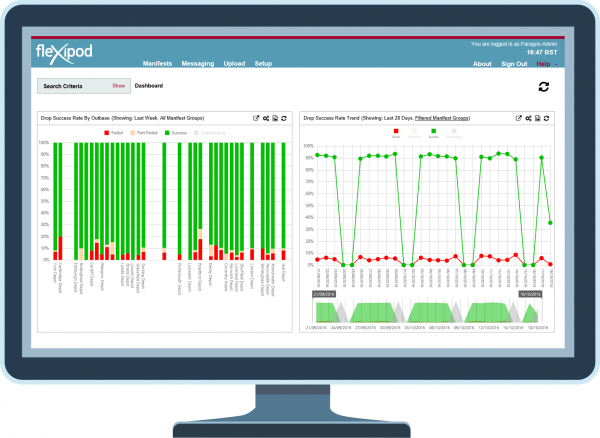 In addition, fleXipod can be integrated with other business systems to improve data visibility across your operation. Amend processes – Amend processes that mobile workers must follow without any need for costly software changes or disruptive change management processes. Whether you wish to implement an improvement identified during data analysis, respond to regulatory changes, evolving customer demands or issues flagged by staff, you are able to amend processes as necessary. Using the fleXipod proof of delivery application, your drivers can quickly and easily collect a range of data, such as proof of delivery signatures, customer services surveys and on-site risk assessments.